Fans of Star Trek were a-twitter over the first season of Star Trek: Discovery ending with a distress call coming from the Enterprise and its commander, Captain Christopher Pike. For Season Two, CBS has announced who will play that role — Anson Mount, best known for his role on Hell on Wheels, and perhaps infamously (though not his fault) as Black Bolt on ABC’s Inhumans, which won’t be coming back for a second season. Mount is a strong choice. 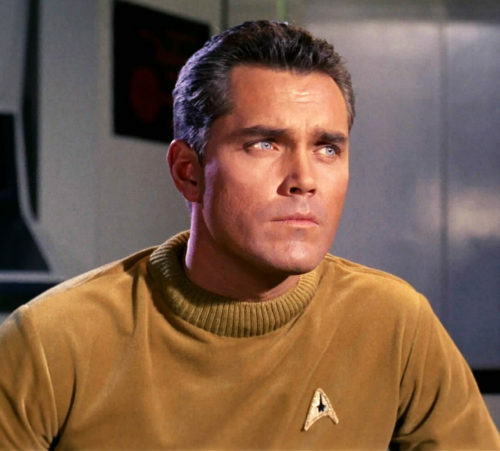 He has a decent resemblance to the original actor to portray Pike in “The Cage,” Jeffrey Hunter. (When edited into the ongoing series episode “The Menagerie,” actor Sean Kenney played an older, scarred, and disabled Pike.) The actor certainly looks more like Hunter than Bruce Greenwood does in the Kelvin timeline films. Though producers insist that the focus will remain on the Discovery and not the Enterprise, this turn raises the specter of another major reintroduction — who might play Spock? Depending on how tightly the Star Trek staff coordinates the novels — perhaps not as tightly as Lucasfilm does with Star Wars — the Enterprise has already played a crucial part in the continuity of Star Trek: Discovery. In the prequel novel Desperate Hours, Michael Burnham teamed with Spock while Captains Georgiou and Pike found themselves caught in a difficult situation with a mining colony. If Discovery takes us onboard the Enterprise, it’s already been established that Spock is First Officer. Let the speculation begin!